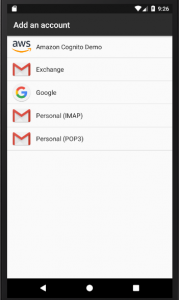 If you have an Android phone, you can go into Settings > Account and add accounts for your internet services like Gmail. However, this area is an extensible on-device secure identity store that other applications can use to store their own credentials. If your app needs to synchronize with a cloud-based data store, you need to implement your own account manager to use the Android Sync Framework. You could provide a sign-in and sign-up UI within your app and never have to think about the Account Manager. Many apps do this already. However, there are several advantages to Account Manager that make it worthwhile to understand. The Account Manager is the standard method on Android to authenticate users. It simplifies the process for the developer. It automatically handles several scenarios for you (like access denied and multiple token types) and can easily share authentication tokens between cooperating apps. Finally, and likely most importantly if you are reading this series of articles, it has support for background processes like synchronization services. Your account type also appears as an entry within the phone settings, as shown in the following image. Create the authenticator, which does the actual work. Create the activities where users enter their credentials. Create the service so we can communicate with the authenticator. Whenever your app needs an authentication token, it only communicates with one method – the AccountManager.getAuthToken() method. The Account Manager authenticates the user, displaying a UI that is designated, if necessary. You can implement the authentication service (including the authenticator, activities, and service) as an apklib so that it can be used by multiple apps, or you can integrate it into a single apk with your app. addAccount() is called when the user clicks the Add Account button in the Account page of the Settings app. getAuthToken() is called when an app (including your app and the sync framework) tries to retrieve an authentication token for the user from a previous successful login on this device. If one is not available, the user is prompted to log in. In both cases, this is mostly boilerplate code. You substitute the name of your Activity, which does the authentication, and you manage the token type. In the following code, we show only one token type. * based on Amazon Cognito. This is a read-only mapping of the valid auth token types (we only have one called rw) and their common display names (Read-Write). You can add other types here and provide the appropriate code to produce them when you prompt for authentication. Open the AWS Mobile Hub console. If you do not have an AWS account, sign up for the AWS Free Tier. If this is not your first project, click Create a new project. Type a name for your project, and then click Create project. Click the User Sign-in tile. Scroll to the bottom of the page, and then click Create user pool. Click Integrate in the left menu. Click Download in step 1. This downloads the awsconfiguration.json file that contains all of the resource constants for your project. You have no configured your project to include a simple sign-up / sign-in flow with email verification of the account. Choose New > Android resource directory. Place the awsconfiguration.json file in the created app/src/main/res/raw directory within your project. // Produce the account. If  the account is new, create it. Most of the work is done within the IdentityManager onSuccess callback, which adds the account to the Account Manager if requested. IdentityManager then sets up the result with the appropriate callback information (most notably the authentication token) and finishes the Activity. 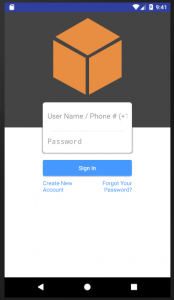 We are using the native UI included in the AWS Mobile SDK for Android to ask for credentials. 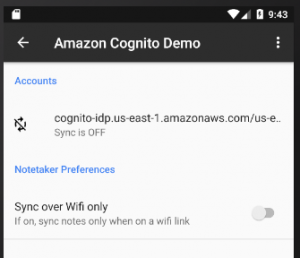 The native UI supports the following authentication flows for Amazon Cognito User Pools, Facebook, and Google: sign-up with validation, forgot password, and sign-in with optional multi-factor authentication. The AUTHENTICATE_ACCOUNTS permission was added to the list of permissions. The CognitoAuthenticatorActivity activity was added as a valid activity. The <service> node was added, referencing an authenticator.xml file. There are a number of issues with this authenticator that we didn’t cover. For example, if you fail to sign in successfully, you cannot close the authenticator. You also can’t delete an account. These issues would need to be solved before this code is considered production ready. However, we will move on and look at the approved method of synchronizing offline data with a cloud service in the next article.